Drenched in a colorful array of yogurt based pani and stuffed with tangy masala, Rainbow Dahi Shots are delightful, delicious and irresistible. A festive twist on the classic Indian street and comfort food, this version of panipuri is the perfect blend between colors and flavors! The combination of neutral puri and spicy coriander mint flavored water is the standard now. What makes my panipuri so amazing is the creation of dahi (yogurt) shots. Keeping the conventional pani aside, I created three dynamic varieties of dahi based pani. These new shots deliver a mind blowing blend of spicy, sweet, and tangy flavors. The first shot is mixed with beetroot. The second is infused with turmeric, curry leaves, mustard seeds and the third one has mint, cilantro, ginger and chili. All the three shots are flavorful and unique in themselves. They don’t just display a beautiful array of colors, but leave a tantalizing flavor once eaten. Enhancing the already flavor-packed panis, there is panipuri masala with tomatoes, onion, chana and other flavor busting essentials. To feel the blast of textures and tastes inside your mouth, you just have to stuff a hollow puri with the masala and drench it in one these exciting shots. The dahi flavored pani puris are a great appetizer option for parties, and I bet once your guests eat it, they won’t be able to stop themselves! 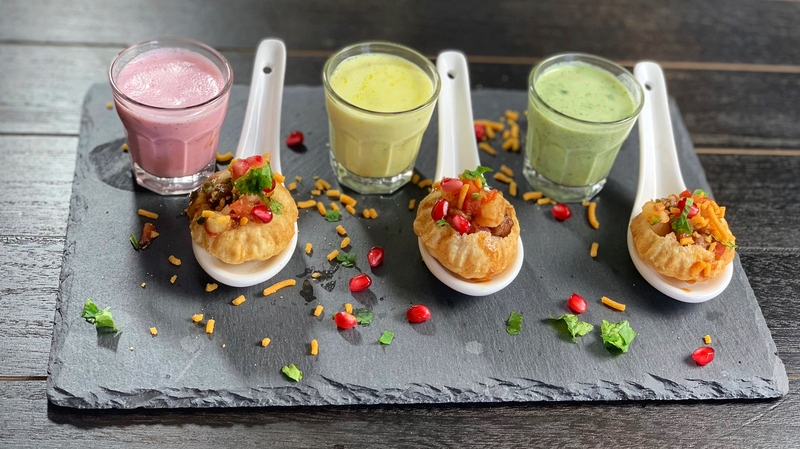 Rainbow Dahi Shots - a festive twist on the classic Indian street and comfort food, this version of panipuri, drenched with yogurt based pani and stuffed with tangy masala is the perfect blend between colors and flavors! For the beetroot shot, mix together all ingredients and keep aside in a separate bowl. For the mint shot, mix together all ingredient and keep aside in a separate bowl. For the turmeric shot, mix together yogurt, water, mint leaves, cumin powder, sugar, and salt. In a small saucepan add the oil, and add mustard seeds, dried chilies, and curry leaves when the oil is hot. Let them sauté and add turmeric powder. Immediately add the mixture to the turmeric shot and keep it aside. For the filling, mix together all ingredients and adjust the seasoning to taste. For assembling, make a hole in the puri’s center with your thumb and put in the filling inside. Add in the shot of your choice along with some garnishes like sev, pomegranate seeds, and tamarind chutney. Enjoy!